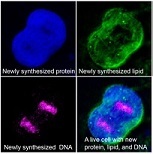 Imaging tool flags new proteins, lipids and DNA to track metabolic changes in animals. Imaging tools like X-rays and MRI have revolutionized medicine by giving doctors a close-up view of the brain and other vital organs in living, breathing people. Now, Columbia University researchers report a new way to zoom in at the tiniest scales to track changes within individual cells. Illustration: As living cells absorb heavy water, deuterium is incorporated into newly made proteins, lipids and DNA. When the researchers aimed the light of a stimulated Raman scattering (SRS) microscope at a single cell, each of the macromolecules above could be identified within. Wei Min lab/Columbia University.